It was the “as much as 32 times faster” that I was confused at. I saw no reason for this limit. Sure, if you have 32 CPU cores, then that’ll be the limit, but what if you had…. say…. 72 of them? Luckily I just happened to get access to such a machine, thanks to our friends over at Postgres-Pro. I decided to perform the same TPC-H Query 1 that I had used last year on the 32 core server. This performs some fairly complex aggregation on a single table. My weapon of choice was PostgreSQL 9.6. I decided to use a dataset 1 TB in size, meaning that there was about 6 billion rows in the “lineitem” table. The output of the query produces only 4 rows, which means the parallel part of the query, in this case a Parallel Seq Scan, followed by a Parallel Partial Aggregate is the vast majority of the work, whereas the sequential part, the Finalize Aggregate and the Sort, are very short, and they only produce 4 rows. Due to the high number of cores in this server I performed this in increments of 4, after having reached 4 parallel workers. We can see that the server is able to scale quite well up until around 72 workers, where the efficiency starts dropping fast. That’s not too big a surprises giving that this server has 72 cores. 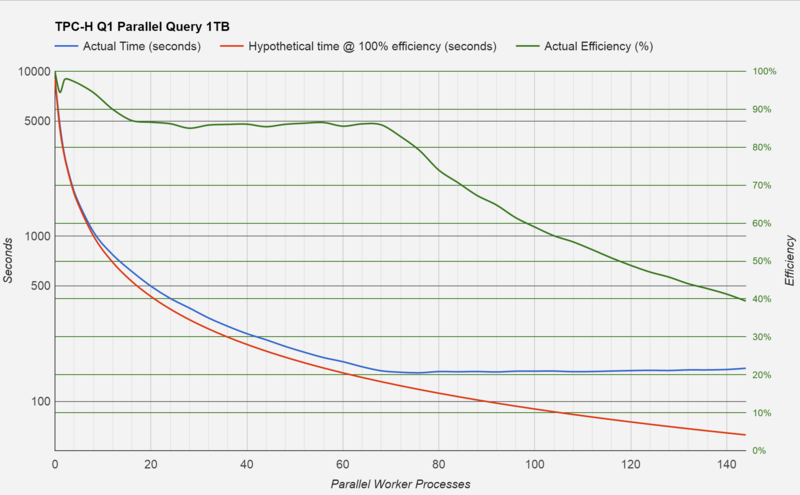 In this case 100% efficiency would mean that if we went from 5 workers to 10 that the query response times would half. The red line in the chart marks this theoretical maximum, and the green line (efficiency) shows how close we actually got to this. I created a “base time” to calculate this efficiency by simply disabling parallelism altogether, and running the query on a single CPU core, which resulted in a query time of 9052.8 seconds. The fastest times I saw were around the 72 to 76 parallel worker mark, with 149.7 and 148.6 seconds respectively. This means we got a speed up of almost 61 times! Slightly more than the 32 claimed by the release notes. Is that undersell over deliver, maybe? I thought I’d remove the log scale on the seconds axis, just so we can see the performance in linear time. 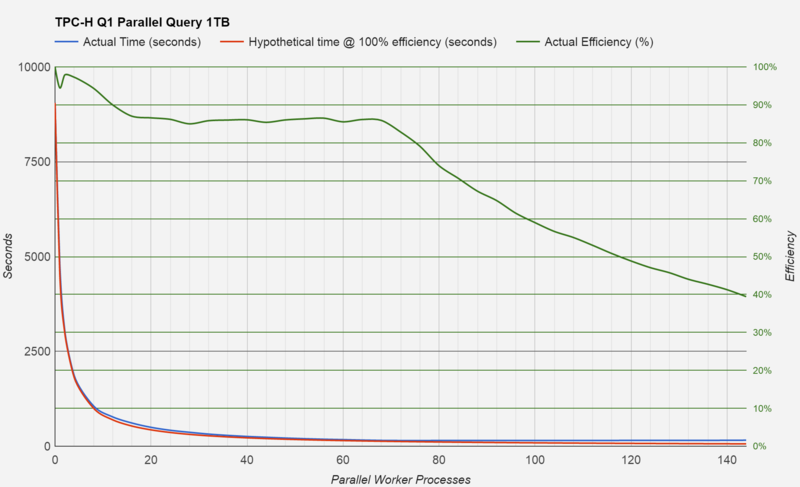 Not such a useful chart, but impressive how much performance has increased over the non-parallel query. OK, so just where are the limits? Well, I just so happened to test that too! Of course not all limits, but I wondered where the scaling would stop on this machine. I simplified the query to become a simple SELECT COUNT(*) from lineitems; and on testing, I came hard up against the lock which the parallel workers use obtain the page number which they’re to process next. This stops two workers both processing the same page, which would give incorrect results. Within this lock, the parallel worker is only trying to get a page number to look at next, not the actual page itself. This means that the parallel worker processes were waiting for other fellow workers to simply read a 32 bit numerical value and add the value of 1 to it (so it’s ready for the next worker to read), before finally releasing the lock. Which means if we added even more CPUs, I’d have eventually hit this lock in TPCH-Q1 too. The great news is that this will be very easy to put right, as currently the workers only take one page at a time. If we just gave them a few at once when the table is large, then that would solve that problem as each worker would have more work to do before having to check what it should to do next. Thanks to everyone involved in making PostgreSQL a parallel processing monster! I’m truly excited to what we can achieve here in the future. Was HT enabled…? I’d have thought there’d be some improvement between 72 and 144 workers. Curious to know if there any way to increase the number of worker settings for all the tables inside the schema? Assuming you wanted to set parallel_workers to 8 for all tables in the public schema. Although you’d need to do this again when a new table is created. You might find that you’d be better paying attention to the size of the table rather than which schema it is in. I’ll just assume you have a schema full of big tables though, and know what you’re doing. A very useful and informative post! I’m just wondering what tool(s) you used to detect the page lock being hit when you changed to using the SELECT count(*) query. Thanks. perf simply showed heap_parallelscan_nextpage() very high in the profile of a worker. Hey, David, could you please publish the PostgreSQL config you were using to do the tests? Thanks a lot! And great post, BTW!